How Can AR Help Architects and Civil Engineers? Augmented Reality (AR) is an advanced technology that enables superimposition of computer-generated images over an existing, real-world view. Having a long history, AR has reached across numerous industry sectors and dates to 1950s when Sensorama Stimulator was being designed by Morton Heilig, an American pioneer in the Virtual Reality. The 1990s saw AR in the mainstream with the application of scrimmage and virtual first-down lines in live football matches on television. The AR market is on an upswing - with a $1 billion potential in the year 2016, revenue forecasts predict this technology to reach $120 billion by 2020! With Augmented Reality reaching out to numerous industry sectors including art, commerce, archeology, education, gaming, healthcare, fashion, military, sports, television, navigation, etc., the forecasts seem realistic. Today, AR is a technology that is revolutionizing the realm of engineering by helping architects in designing innovative projects and helping their clients to better visualize the architectural plans without any unnecessary costs. However, one of the biggest advantages offered by AR for the construction and architectural industries is the ability to visualize a project more realistically. Augmented Reality has widespread applications in architecture and design, and adds enormous value to the architectural projects by effectively portraying what exactly an architect is trying to convey. A major AR help to architects is the ability to showcase architectural models in a totally new way. Let us now evaluate how architects use AR to create superior designs and persuade their clients better. AR helps architects to place a 3D model of the proposed design on an existing space, which provides an augmented view of the overall architectural plan to the client. The virtual model of what a project will look like upon completion helps clients and potential prospects visualize architectural plans better. Using AR technology enables the potential investors or buyers to get a better view of the architectural plan as if they were in the real scenario. This kind of user experience makes it easier to understand the plan better and suggest changes where required. AR benefits multiple areas of design development and makes it interactive by providing the option to touch and encourage interaction. Apart from providing a better spatial awareness of the completed proposal, it also gives a chance for refinement and modification. Besides, the finished models can be quickly altered and experimented with different color palettes and patterns, building materials, and building facades, along with the potential to be customized. AR allows the users to walk through the designs, as a part of the designing process. Such 3D architectural walkthroughs enable the users to see first-hand how the spaces can be utilized and then develop or improve the plan from there. By providing superior visualization, AR promotes efficiency in design practice by helping architects to reduce errors, shorten the design time and eliminate possible miscommunications with the clients and prospective buyers. As AR allows the models to be viewed on tablets and smartphones, users can get an immediate access to a lot of information without the need for larger models or huge rolls of paper, which easily get damaged. AR empowers architects with the ability to quickly and easily visualize and create efficient architectural plans and communicate the same to their prospective clients. The translation of a drawing into full-fledged structure is certainly not an easy task. It involves multiple steps, which include identification of various structural elements followed by a flawless construction. As a project is generally envisaged in stages, errors might slowly creep in during construction. However, as AR provides a virtual image of the construction structure, such errors can be easily eliminated. AR can be used for optimizing the designs for better utilization of the available space, thereby preventing any wastage of space. Spatial models can be created using AR, which help the designers in identifying and rectifying the flaws while designing. Besides, this technology also helps in coming up with innovative designs, as the civil engineer will be able to visualize the structure better and make numerous beneficial changes. One of the most important benefits offered by this technology to civil engineers is the minimization of errors that occur while implementing the completed design during construction. AR provides a virtual design of the entire construction field, making it easier to control various processes, thereby helping the engineers achieve a better output. Explaining construction projects to people without a technical background is a problem faced by majority of the civil engineers and architects. Even extraordinary architectural drawings, which are generally on a smaller scale or the 2D designs, might not serve the purpose if they cannot be comprehended by the target audience. However, by making use of the AR concept, clients can be presented with a virtual tour using different colors and providing different views of the project. This serves as a superior marketing strategy, which can be implemented by realtors and other businesses in the construction industry. Using AR will reduce the errors that tend to occur while executing an approved civil engineering plan. The errors can be caused by numerous factors such as misreading of drawings, calculation errors, etc. Such errors can be easily avoided by using AR, which enables continuous monitoring and reviewing of the construction work to ensure that it completely adheres to the approved plan. This prevents possible errors and eliminates the time and efforts required to rectify such errors, thereby saving enormous time and valuable man-hours. Building plans under consideration can be easily reviewed by project managers and other authorities on a real scale using AR. This helps them quickly identify small errors or problems, which have managed to escape from the civil engineer's eye and creep into the construction phase. As error rectification prevents the possible errors during construction, the costs associated with the manpower and the materials used are also minimized, thereby reducing the overall cost of a construction project. 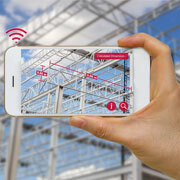 Augmented Reality in civil engineering and architecture has offered proven benefits. Although new applications of this technology are still under development, AR is becoming easy to procure in terms of the required software, hardware, and associated costs. With companies seeking new and promising methods to streamline processes, add value to the business and improve the bottom line, AR will soon become a common term. With our services spanning across multiple industry sectors, at Outsource2india, we stay updated with all the technological innovations in the domains we serve. This multi-domain expertise enables us to understand the requirements of our global clients and provide highly efficient services that precisely cater to their needs. Besides, we have multiple delivery centers worldwide, which allows us to complete architectural and civil engineering projects in a short turnaround time and maintain uninterrupted business continuity. Having best-in-class infrastructure, tools, and technologies in place, all our services are reasonably priced. However, the workflow and quality assurance remain uncompromised. Therefore, if you are looking out for a reliable outsourcing partner for your architectural and civil engineering needs, then you are at the right place. Feel free to reach us now to discuss your project and understand how we can assist you.